Back in Germany in the 1930s, my father had a second cousin who drove a taxi. He was a Jew and a Communist. One day some Nazi cab drivers beat him to death. No one did anything about it: it was OK to murder Communist Jews in those days. I remembered this story while thinking about the events in Charlottesville, Virginia last weekend (August 13, 2017), where there was a legal demonstration by American Nazis and their sympathizers. The demonstration was ostensibly to protest a decision to remove a statue of Robert E. Lee, the Southern slaveholder and rebel who led the Confederate Troops against the legitimate government of the United States in the American Civil War of 1861-65. There was also a counter-demonstration. One of the Nazis drove a car into the crowd of counter-demonstrators and killed Heather Heyer, a 32-year-old woman. Nineteen other people were wounded, including one young man severely beaten around the head. On August 13 it was reported that five people were in critical condition in hospital. But you might say there’s no equivalence between Nazism in Germany in the 1930s and Nazism in the US now. There’s still a free press and free speech in the US, and many people denounced the white supremacist and anti-Semitic marchers. The man who drove the car was arrested (though I’m not sure about the people who beat up and injured the other 19 people). Even President Donald Trump (sort-of) denounced the Nazis, though he claimed there were good people on both sides. That’s hard to believe if you watched (admittedly liberal, anti-racist) CNN, and saw footage of protesters shouting “blood and soil” (a slogan from 1930s Nazism) and “Jews will not replace us!” (I’m not sure what the latter slogan meant). But there is a kind of equivalence between German and American Nazism. With all the other stuff going on, we forget that the unarmed counter-demonstrators in Charlottesville were extremely brave people. They faced a group of heavily armed men carrying assault rifles; Virginia is an “open-carry” state, where citizens can legally carry weapons. According to an African-American pastor whom I saw last night on CNN, they also carried improvised weapons such as bottles filled with urine and cans with concrete. So as shocking as events in Virginia were, we should be grateful that nothing worse happened. One or more of the Nazi terrorists could easily have started firing and killed scores of people. The US has two sets of laws that would be inconceivable in any other Western democratic state. The first is gun laws that permit practically anyone to buy outrageously dangerous weapons. The second is unrestrained freedom of speech laws. In Canada, if people shouted racist and anti-Semitic slogans at a demonstration, they could be charged under hate-speech laws. Laws prohibiting late speech are also permitted by the United Nations Convention on the Elimination of Racial Discrimination, a Convention that the US originally opposed because it would have prohibited some of its racial segregation laws. I am a strong supporter of freedom of speech, but I also support hate-speech laws. Some of the white supremacists wore white robes reminiscent of the Ku Klux Klan. Others wore military-style clothing. All of this was legal. To me, this looked like armed private militias, which are against the law in most countries. That the US tolerates such armed militias suggests a further resemblance to Nazi Germany. 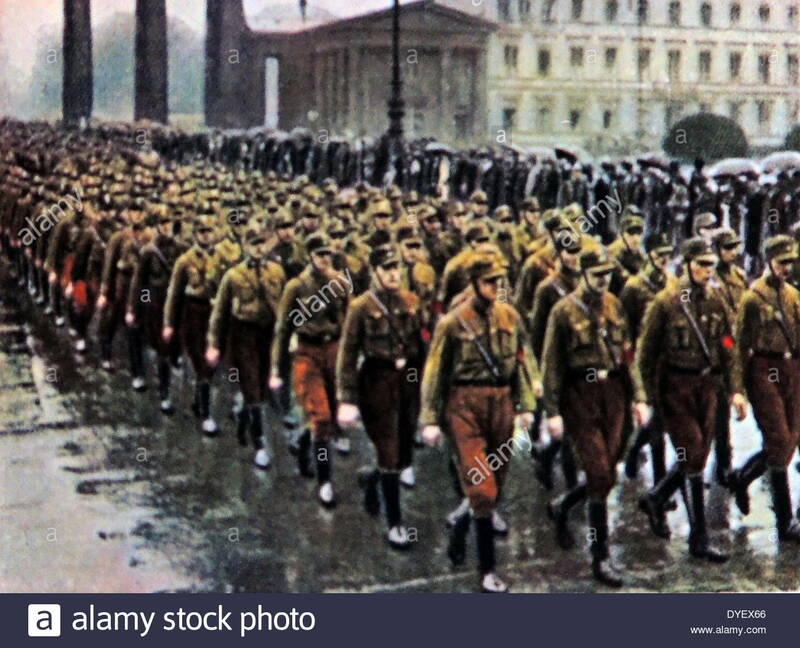 Hitler’s militias started making trouble in the 1920s, and by the 1930s many people tolerated them. I am not suggesting that the US is likely to become a Nazi state. I am suggesting that the new, proud and public Nazism we saw last week reflects a President and Administration who—if they are not white supremacists themselves—certainly seem to sympathize with those who are. The President denounced white supremacists and the KKK in what appeared to be a scripted speech on August 14, but then reneged on his denunciation the next day. Probably his Jewish daughter and son-in-law had pressured him to say something he didn’t really believe. When he reneged on his condemnation, Trump asked, “who’s next?” If we remove statues of Robert E. Lee, he asked, will people soon want to remove statues of George Washington and Thomas Jefferson, early US Presidents who were also slave owners? Perhaps that’s a good idea. Alternately, all statues of former slave-owners, or buildings built by slaves, or universities funded by slave-owners, should have plaques placed on them, explaining their relationship to slavery. I am not one of those Canadians who goes around flaunting moral superiority to Americans. To the contrary, I support all those American liberals who find themselves having to defend freedom of the press, racial equality and other liberal values against the extremist and possibly Nazi-sympathizing individuals who currently inhabit the White House. Even worse are those Republicans who don’t hold white supremacist or anti-Semitic views, but who support Trump because he promises to lower their taxes. Just as in Germany, it’s not only the disenfranchised working class that supports Nazis. Many of Hitler’s supporters were rich, upper-class people who wanted to protect their property and privilege against the Communist threat. There’s no such threat in the US, but there are still a lot of rich people who want to become even wealthier than they already are. This shameful behavior by Republicans is even more a threat to American democracy that the horrible Nazis who demonstrated in Charlottesville last weekend.